Fryderyk Franciszek Chopin was a Polish composer and virtuoso pianist. Chopin was born in Żelazowa Wola, a village in the Duchy of Warsaw. His father was a French living in Warsaw as a French teacher and his mother was a Polish. As a renowned child-prodigy pianist and composer, he grew up in Warsaw and completed his music education there; he composed many of his mature works in Warsaw before leaving Poland in 1830 at age 20. 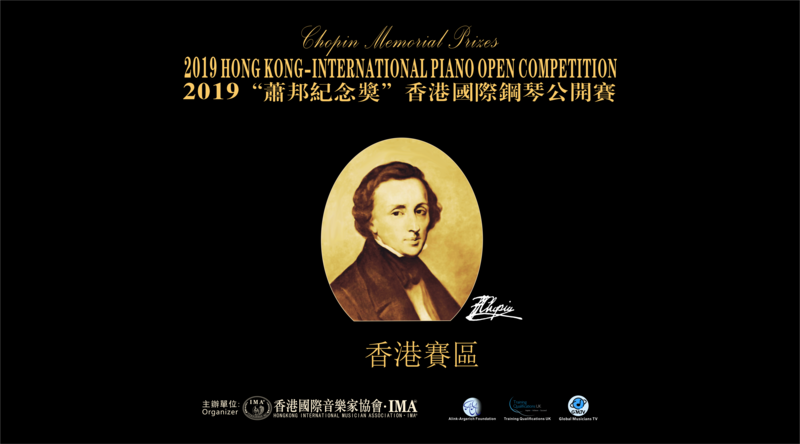 Known as the “poet of the piano”, Chopin is widely considered as one of the most influential and popular composers in history, one of the most important people in music history of Poland and one of the greatest Romantic composers.“Chopin Memorial Prize”Hong Kong International Open Competition will be held every two years. The activity includes not only the competitions between contesters, but also the “Chopin Theme Concert”,”Chopin’s Works Appreciation Lecture” and the masterclasses given by the guests and judges from around the world.“If we find the key to the Magic Chopin, we can overcome all the difficulties,”said Arthur Rubinstein, a famous Polish－American classical pianist. The Jury of Preliminary Contests:Famous piano educationists and performers from Hong Kong，Taiwan，Mainland China and overseas. Poland，Germany，England，America，France，Hungary，Austria，Australia，Korea，Russia，Ukraine，Mainland China，Hong Kong，Taiwan and more than 20 countries and areas.